I'm trying to learn to use VPHOT instead of AIP4WIN. I am in awe of VPHOT's ability to plate solve and automatically find and apply comparison stars, but I cannot find any guidance on how to make VPHOT calibrate raw images (i.e. apply biases, darks, and flats). Obviously, I can do the calibration offline and upload the calibrated images, but there must be a better way. Can someone give me a pointer here? Also, VPHOT is not calculating the airmass of my observations (as AIP4WIN does), even though I think I am giving it all the information it needs to do so. Any ideas? 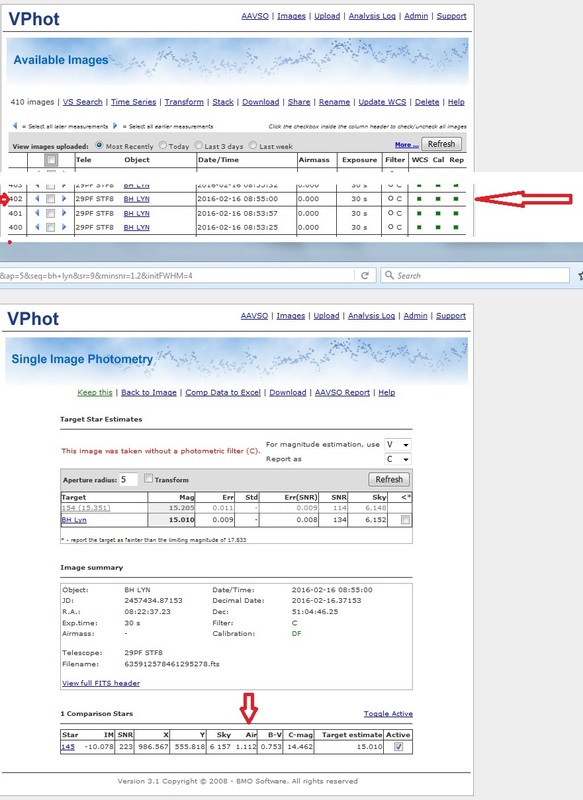 VPhot is not set up to calibrate your images. It would need to store your (and other) users calibration images. All the observers calibrate their images locally and that is probably the easiest way. I happen to use Maxim to calibrate a batch of images after I collect them. If you share one of your images with me (MZK), I can compare your fits header to one of my images to see what keyword might be missing for airmass. I just keep forgetting without looking it up again. The FITS keyword is AIRMASS. I checked my raw images (before calibration with AIP) and before plate solving. The airmass is already there, so it must be written to the header, in my case, by TheSky6+CCDSoft. As Ken has said, VPhot expects a calibrated image. Most AAVSO CCD observers that I know use either AIP or MaximDL for this. Thanks, Ken and Phil. Of course, if I had spent more time reading what was already posted, I wouldn't have had to ask these questions. I use Nebulosity 4 to take the images and AIP4WIN to calibrate them. Unfortunately, Nebulosity doesn't know what my telescope is doing, so the necessary parameter for calculating air mass (namely OBJCTALT) is not written to the FITS header. So I've written a small vbasic program to calculate the object's altitude from its position and the local time, and write it to the header before uploading the image to VPHOT. This solves the problem of calculating air mass. Right now, the program's code is pretty specific to my setup and location, but it wouldn't be hard to generalize it, if that might be useful to others. Its a long pipeline of programs we pass our data through to get it into the WebObs! If you apply your transformations with TransformApplier after you process your data with VPhot then TA will take care of any missing AMASS values (provided you supply your observering location!). Yet another reason to have your data transformed for AID! In the past I have had problems with the AIRMASS not appearing in my FITS headers for reasons unknown. So, I now use AstroImageJ (AIJ) to add that keyword, plus it will add a few others that are sometimes useful (esp. Helio centric Julian date). If selected, it will also automatically plate solve using Astometry.net. It does a pretty good job, but does fail sometimes when their computers are really busy or the image has problems. and also added some features for VPHOT FITS header upates such as AIRMASS and CALSTAT. I've been using AstroImageJ a bit too and agree that the plate solving integration with astrometry.net is nice. At some point I'd like to switch over to AstroImageJ for ensemble photometry but I don't yet have a handle on all of the steps necessary. Anyone using it for DSLR currently? I fooled around with AIJ and while the calibration routines and Astrometry features were very nice, I couldn't find much documentation for the way the program handled color channels. As far as I could tell the final outputs were just instrumental magnitudes and there was no attempt to implement ensemble or transformation coefficients. I'm no programmer and no expert at AIJ though. There were times I was wishing for Iris and its simplicity!! It does have provision for time series displays but I keep my DSLR work pretty simple. For me to use it I would have to process things in a piecemeal fashion with different programs. I still use it for plate solving though. Of course AIJ outputs ensemble magnitudes if you can find them in all the various flux headings in the tables. Sorry if I give the wrong impression in my last email. It would be great to see a tutorial that bridges the gap using AIJ for DSLR ensemble photometry. I know Mark Blackford was looking into that at one point. As for myself, I'm currently still using IRIS for all processing, a couple of python scripts I wrote to do some minor things like FITS header changes and RAW file renaming to make life a bit easier when working with IRIS, and essentially the Citizen Sky spreadsheet (with adaptations by Mark) to take the ensemble of instrumental mags for target and refs to get "transformed" Johnson V values. How does that compare with your DSLR pipeline? You mentioned you use AIJ for plate solving, so do you then use VPHOT for your DSLR photometry? I have tried that and would like to do so again but last time I looked, I don't think I could produce the desired V mag(s) I need from the ensemble of IMs. I think there's also been talk of adding support for DSLR to TA etc. So anyway, for now, I use a simple IRIS based approach, which works fairly well but is time intensive. I'd be interested to hear what you are doing. Instead of putting all this processing flow into this forum if you will PM me at mccammon@comcast.net I will be happy to share what I am doing with you. I think you are right in thinking that an additional explanations are necessary in the DSLR tutorials. DSLR photometry is a recent enough phonomenon that mentors are pretty scarce. I look briefly at AIJ as an alternative to IRIS for future DSLR Photometry courses but didn't have the time to fully assess it. AIJ looks promising but I couldn't work out how to open DSLR RAW files and extract colour channels directly, I had to use a separate program for that step. Maybe that isn't necessary. About a month ago I came across this paper on arXive which describes AIJ in great detail. I agree that a tutorial on using AJI for DSLR ensemble photometry would be great. Once it's in a polished state it should be included in the AAVSO DSLR Observing Manual along with the tutorials for other packages. I'd be happy to be part of that process but can't lead it at the moment due to work commitments for the next few months. David, are you planning to come to Sydney for the Variable Stars SOuth Symposium and NACAA at Easter? It would be great to catch up if you can make it. John, your welcome too but I appreciate it's a little further for you to travel. I'll probably have to miss that one! Agreed re: AIJ tutorial becoming part of DSLR manual. It'd be a good thing. I just recall that you had looked at it a bit too. To be honest, it wouldn't be too onerous to use IRIS (or Muniwin or any other free software) for calibration and green channel extraction then just use AIJ for plate solving and photometry. I'm not wedded to having to use just one tool. I'd also be happy to return to the idea of VPHOT in this context, again, using IRIS or other software for calibration and channel extraction; just don't know whether it's a good fit yet. I've been vacillating on the question of NACAA. I want to attend, indeed, have attended every NACAA since it was held in Adelaide in 2002, although last time in 2014 I could only attend for one day. I'd especially like to attend the VSS workshop, so even if only that. It's a matter of being able to justify the funds currently, and time away, from a family viewpoint. I will decide soon. I should have booked flights/accommodation a couple of months ago. I have a conference for work in early March but that's not a clash. Yes, it'd be great to catch up. I'll keep you posted. If you have a missing Airmass (like I do when using my own equipment) you can find it out at looking at the report VPHOT gives you on the single image photometry. VPHOT does NOT, however, carry that forward to the report for a time series. The example on the attached shot shows which image was measured and this agrees with what I got using my spreadsheet, and subsequently submitted to AAVSO. Since VPHOT already has the Airmass, perhaps if we raise a point to get this carried over into the output file, it will happen the next time that VPHOT is reviewed. Reduced 2 nights of data and apparently, the number of digits past the decimal point for Air Mass has change from 3 as I remember, to 5 or 6. WebObs will not accept this. Is there somewhere that I need to reset this? As far as I know, I did not change this. My last AAVSO report created in VPhot on June 3, 2016 shows three digits after the decimal point so it has a total of 5 characters including the decimal point. However, my report generated by VPhot on June 4 (a few minutes ago) has 5 digits after the decimal point for a total of 7 characters. I have no knowledge that the airmass format generated by VPhot was changed yesterday. I have asked George to comment? However, more interesting is the fact that my earlier VPhot report with the proper number of airmass digits still gave the error message of too many digits upon uploading to webobs a few minutes ago (Bill reported the same problem)! Still lots of issues after the Drupal upgrade!!?? George Silvis confirmed that no changes have been made to VPhot code. He is looking into problem. Are there any plans to make VPHOT and the transform routines downloadable, so i can run them on my computer? Saves pushing a couple hundred images over the net. I could just send the transformed results to AAVSO. Have you tried TA (Transform Applier) which you can apply to AAVSO Extended Format files to transform your data. There are no plans to make VPhot a stand-alone product for personal computers.